Attrition Mills provide high-intensity scrubbing to remove coatings and stains from sand feeds and to disintegrate lignite. Two five-bladed propellers per shaft force the sand grains to grind against each other. This provides the scrubbing action needed to remove those coatings and stains and gives direction of movement to the material, allowing it to travel from cell to cell inside the machine. With a machine that works this hard, you’ll need to ensure it is properly maintained. Properly maintaining your Attrition Mill can help keep it in peak operating condition and help you avoid unexpected downtime. It starts with a daily maintenance routine that involves inspecting your Attrition Mill’s components, checking oil levels and listening for unusual noises. Before maintaining or serving any portion of your Attrition Mill, however, be sure you read the Installation, Operation and Maintenance Manual in its entirety, follow all lockout/tagout/block procedures and follow all safety tags. After de-energizing the machine, try turning it on just to make sure the power can’t get to the machine. Failure to follow these procedures could result in injury or death. Inspect the drive motor and all bearings and shaft housing-supports and hardware for tightness. Inspect the oil breather area of the mixer drive case for cleanliness. Check the oil level of the mixer drive and lubricate all applicable bearings and components according to the information presented in the Lubrication Section of the Installation, Operation and Maintenance Manual. This section will provide detailed information on the type of grease/oil that should be used, as well as how much grease/oil to insert and where. Inspect all bearings for excessive heat, noting that no bearing should be hotter than 120°-130°F (52°-55°C). If you do encounter a bearing that is too hot, refer to the Bearings Section of the Installation, Operation and Maintenance Manual for more information on how to proceed. Inspect the drive motor for excessive heat. Again, if the drive motor is too hot, the Motor Section of the Installation, Operation and Maintenance Manual will provide details for how to proceed. Listen to your Attrition Mill, taking note of any usual machine noise. Strange noises could indicate undue stain on the mixer drive, shaft, impeller or other internal part. Finally, make sure all applicable guards are in place and secure. Inspect the area around the drive motor cooling fins and mixer drive for cleanliness. Inspect all electrical cables and connections for cuts or damage. Make sure they are properly secured and sealed watertight from elements. Check the slurry retention and weir height and adjust as needed. Inspect the feed-discharge boxes, valves and piping for wear and possible leaks. Check the fresh water supply valve to ensure it is functioning correctly. Test all Emergency Stop control switches. Check the oil in the mixer drive reducer. For detailed lubrication instructions, refer to your Attrition Mill’s Installation, Operation and Maintenance Manual. Examine the oil in the mixer drive for the presence of water or moisture contamination. If you note any water or moisture contamination, you may need to relocate the breather away from the water/moisture exposure. Check the clean-out valve on the bottom of the cell to ensure it is operating as it should. Check the oil in the mixer drive. 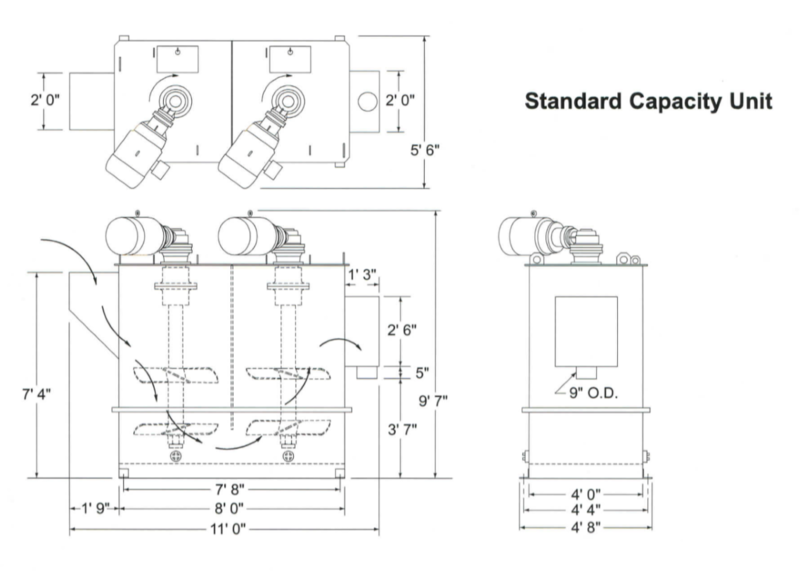 More information about the lubrication requirements can be found in the Installation, Operation and Maintenance Manual you received with your machine. Perform the actions listed with the daily, weekly, monthly and bimonthly inspections. Change the mixer drive oil according to the detailed information in the Lubrication Section of the Installation, Operation and Maintenance Manual after your Attrition Mill’s first 1,000 hours of operation. Grease the upper and lower mixer bearings. Again, refer to the Lubrication Section of the Installation, Operation and Maintenance Manual for information on grease type, quantity and location. Remove the complete mixer drive assembly, which consists of the shaft, impeller, hubs and tank/cell liners, and inspect them for damage or wear. Replace any components as needed. Be sure to include the serial number when you’re ordering parts. Complete the daily, weekly, monthly, bimonthly and semi-annual inspection items. Change the mixer drive oil. More information about how to do this can be found in the Installation, Operation and Maintenance Manual. Eagle Iron Works designs and manufactures their Attrition Mills with the producer in mind. All Eagle Attrition Mills are designed to provide ease of maintenance. An example of this is the drive assembly. The entire assembly, which consists of the cover, shaft and propellers, can be removed from the tank as one unit, which makes maintaining your machine simpler. All you have to do is remove the bolts securing the top plate to the tank and lift the entire unit out. Another example are the two large inspection holes on the top plate. These allow you to check the status of the components without having to remove them from inside the tank. This overall ease of maintenance ultimately helps you avoid unexpected downtime by catching any potential issues before they cause your entire operation to be shut down for repairs. Besides being easy to maintain, Eagle Iron Works Attrition Mills offer a long service life that can handle high-intensity scrubbing action. The tank is made of a heavy steel and features wear-resistant material in locations that receive the most wear due to the scrubbing action on the material. Abrasion-resistant steel lines the feed chute, while the tank and baffle plates between cells feature abrasion-resistant rubber linings. The propellers and propeller shafts are also designed to offer increased service life. The whole unit comes to you ready to install. Eagle Iron Works offers a standard two-cell design and a high-capacity two-cell design that can handle up to 150tph of material. As with all of their products, Eagle’s Attrition Mills are designed and built in the USA. 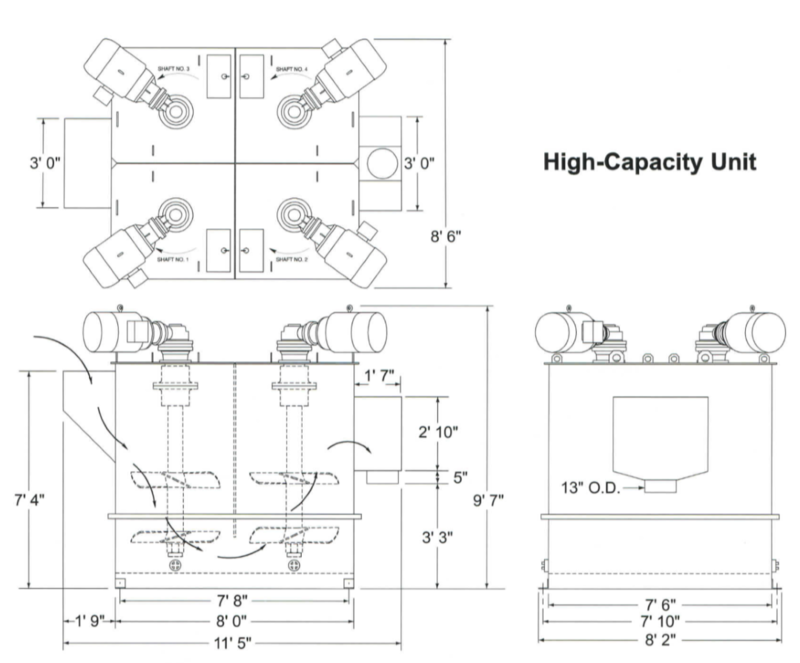 Eagle Iron Works' Standard-Capacity two-cell Attrition Mills can handle 50-75 tph of minus #4 mesh sand. Eagle Iron Works' High-Capacity two-cell Attrition Mills can handle 100-150 tph of sand material. To obtain the most efficient attrition, be sure to provide a constant feed to the machine. The rate of discharge depends on the rate at which the material is fed to the machine. The feed should be between 65% and 85% solids to ensure the most efficient abrading action. Finally, to de-slime the discharge material, follow your Attrition Mill with a Fine Material Washer. For more information about their Attrition Mills, . Don’t miss a future post about Eagle Iron Works! Subscribe today to learn more about what Eagle Iron Works’ equipment can do for you!